Honest quality is our standard, and your satisfaction is our highest priority. Are you interested in starting your own kettle corn business? A professional booth, efficient equipment and our addictive recipe are vital to your success! Call us at 877-707-2676 for friendly advice and answers to your questions, or email us for a quick response! Have questions about starting a kettle corn business? We have answers! We are proud to offer a complete line of financing options through Schulte Leasing. 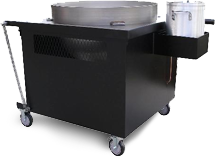 There are many benefits to leasing kettle corn equipment, and even with challenged credit we have options for you, too! Please contact Jon Schulte directly at (949) 246-7467, or e-mail him at JonDSchulte@gmail.com. Please pass along HUGE kudos to everyone at North Bend. My husband was VERY impressed with the quality and workmanship of the equipment. You all are a wonderful blessing and a pleasure to work with! We popped our first batch of kettle corn on Sunday afternoon. It was a success and a huge hit with our 4 kids and their friends. Meet twin brothers Thomas & Robert from California. Robert purchased our Complete Mobile Concession Package in March, with Tom following suit in June! When asked what colors he would like for his canopy, Tom said he wanted “just what Robert got.” Tom is smart; he knew that what had worked for others had worked for his brother, and would work for him, too! Find out how Robert’s first event went. Kevin & Lori’s kettle corn business grew so much the first year that they added another set-up, almost exactly 1 year after they got started! Although these successful business owners’ stories & motivations are varied, they all have one thing in common. None of them jumped blindly into the kettle corn business. They all did their research, put together a plan, and ACTED on it. It’s an exciting time to be an entrepreneur in America!